Walt Disney World isn't known for its thrills, but Summit Plummet is one of the world's tallest and fastest water slides. And it just may be the single most thrilling attraction at the Florida resort. 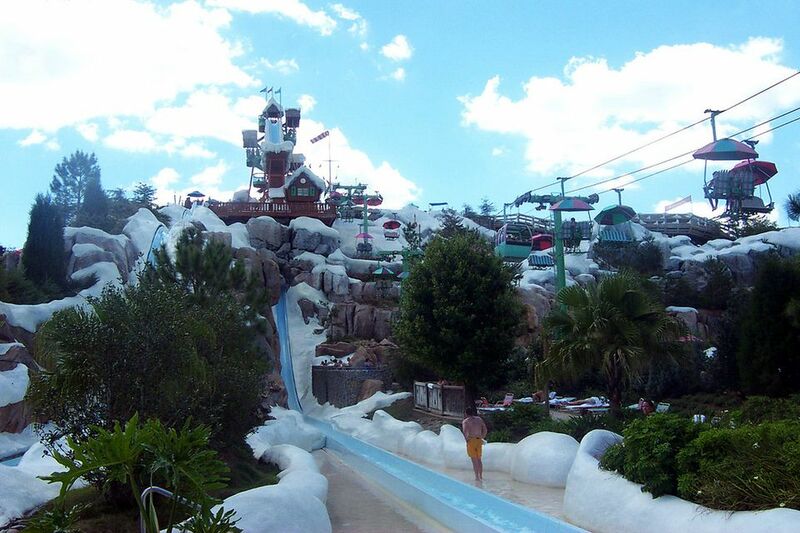 The signature attraction at Blizzard Beach, Summit Plummet towers over everything. Sitting atop Mount Gushmore, it's designed to resemble a ski jump. Every few moments, a rider braves the faux icy slide, and a whooshing spray of water shoots from the end of the jump. It appears as if the riders are careening off the jump and vanishing into thin air. In reality, the slide sends riders zooming through a short tunnel that's behind the ski jump. It's a wacky and audacious sight. By taking the Mount Gushmore chairlift, getting to the ride can be part of the fun. Since the line for the lift can get quite long, however, riders have the option of walking up a (considerably long) path. From the chairlift station, riders must ascend a few flights of stairs to reach the mountain's summit and the slide's loading platform. An attendant helps riders get into position—lying face up with legs and arms crossed to prevent flailing limbs from crashing into the sides of the slide— and gives them the OK sign. It takes tremendous nerve to shove off. Although it's not quite a 90-degree angle, Summit Plummet is so steep that riders can't see anything if they peer over the edge of the slide before they get down into position. It takes blind faith to accept that there is, in fact, a continuous slide that will deposit riders at the base of the mountain. Ironically, once they begin the descent, some riders may momentarily float into the air and freefall as if the slide vanishes. It's the water slide equivalent of roller coaster airtime. Would You be Able to Handle the Ride? Racing through the darkened tunnel and pelted by a curtain of water, riders become temporarily disoriented. Emerging from the tunnel, they regain their bearings and soar down the face of the mountain. Hitting the straightaway at the bottom, riders create a huge plume of water—and possibly, an industrial-strength wedgie. If you plan to tackle Summit Plummet, make sure you wear appropriate swimwear and check it carefully before the ride. As each rider reaches the end, a digital readout displays his top speed. Overall weight and body shape appear to affect the speeds. Children hover around 50 mph. Medium-sized adults register the highest speeds, topping out at a bit over 60 mph. Would you be able to handle Summit Plummet? That depends. If you're overly afraid of heights, it might be difficult to overcome your fears. Unlike a roller coaster, which begins at ground level and takes control of the process, Summit Plummet riders have to walk to the 120-foot level (or take the "ski lift" up to the summit) and initiate the descent themselves. By the way, Summit Plummet used to reign as the tallest speed slide in the US. It's since been eclipsed, however. First, a 121-foot slide, Deep Water Dive at Kentucky Kingdom, barely edged it out. Then, Volcano Bay opened in 2017 at Universal Orlando and introduced three slides that decisively top Disney World's ride. All three of them, including the Ko'okiri Body Plunge, start at the 125-foot-level inside the park's centerpiece Krakatau mountain. Because of their increased height (now the reigning US champs), severe initial drop angles, and the inclusion of launch capsules (making them the world's tallest slides with that feature), Universal's water park attractions seem way more intense than Summit Plummet. Looking for Thrills at Disney World's Epcot?